Almotamar.net - Yemeni Planning and International Cooperation Undersecretary and his Saudi Trade and Transport counterpart opened in Sana'a Sunday the Saudi commercial attaché office. The event was attended by officials of the preparatory committee of the Yemeni-Saudi Coordination Council. Almotamar.net - Director General of Investment Authority in Shabwa governorate Abu Bakr Farid said the governorate is distinguished by opportunities for tourist, industrial and agricultural as well as oil investments. He added it entertains a fertile investment climate in addition to coastal and desert tourist sites. It provides for industrial areas neighbouring the natural gas project. 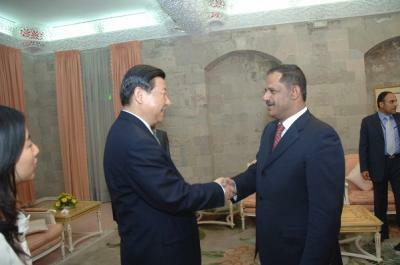 Almotamar.net - The Yemeni Prime Minister Dr Ali Mohammed Mujawar on Wednesday called on the Chinese capital for investment in Yemen in sectors of oil and minerals, fish and fishery seaports, agricultural area and real estate. In his opening on Wednesday the Yemeni-Chinese Investments Symposium in Sana'a , the Premier said, " Areas of investment are many and diversified and we find it as an opportunity to affirm in this symposium our welcoming o Chinese investments in all fields."